I'm a really nice person. Yes, I am direct and sometimes make grown men cry, but never without reason. And a client has given me reason to let out the dogs. Therefore I thought it would only be best for me to share my experience to help other creative entrepreneurs and freelancers avoid this frustration. This property manager owes me money and I am pissed. Not only at him but myself. Until recently, I usually did not require a deposit from my clients. At RC3, we mandate it from every client. It's one of the smartest things to do because if you get stiffed for the total balance for your services, at least you have something rather than nothing. Every time (I kid you not) I lower my standards in life, it ends up being more of a hassle. So as soon as you lower your prices for high quality service, you will regret it. 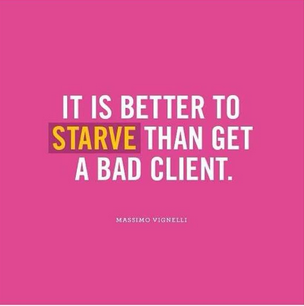 The client will be the most annoying of all your clients. Or the one that tries to take advantage of your kindness. Pays late or never. Calls you any hour they please. This client is a lot like the customer at Ruth Chris who is paying with coupons but complains about not enough ice in the water. Don't do it to yourself. You are worth every cent you make. There are many ways to come up with your agreement/contract; one of which is online and googling "contractor's agreement" and downloading whatever is on there. Take your time. Go through the agreement carefully and make sure it says and means what you want it to. Rushing through this only puts you at a disadvantage. As I tell my clients, "This agreement is to not only protect me, but you as well." At this point, I'm not sure what I'm going to do with this current client but it's not going to be pretty. Taking someone to Small Claims Court for under $100 is not ideal. I primarily want to make sure people know that they should never do business with this man if this is how he "takes care of people". And I've contemplated this for months now. I don't want to be seen as unprofessional but I refuse to be disrespected as a strong professional woman. I am not a girl just trying to fake the funk. I am a woman doing what she loves while making sure her livelihood is taken care of. With all that said, I need to be wise. As Kelly Cutrone said on Kell on Earth, she was going to blast a designer as being a thief cause he refused to pay her for a job that her company did. She mentioned this on the show many times and it clicked for me that this will always be a problem, but it shouldn't be a frequent problem. Therefore, as much as I will love my clients and the start is our honeymoon phase, I will make sure they know from the beginning how serious I am when it comes to people f-ing with my business and future. I may not have kids, I may not own a house or car or whatever else, but all these things start here. Lay down your foundation well.